For one brilliant week in September 2011, the air pollution levels from car traffic in Copenhagen fell by a whopping 30%. 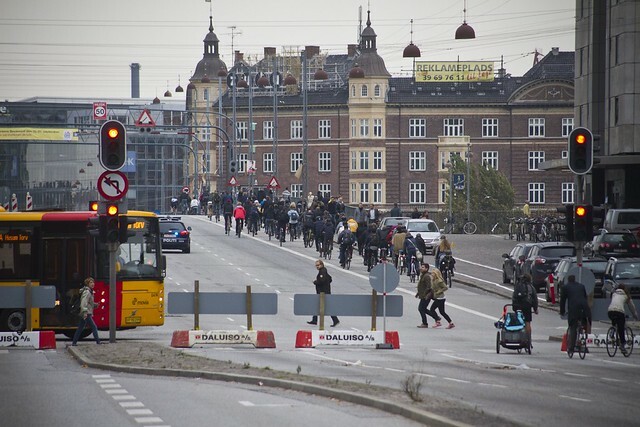 The City of Copenhagen took a bold step in planning the Road Racing World Championships in cycling this year by deciding to close off most of the city centre to car traffic during the event. While most people have tried to calculate the massive boost the event had - and will have - on tourism, Copenhagen's brand and what not, it turns out the event improved the air quality for the citizens of the city. It didn't have anything directly to do with the professional cyclists racing around the city. 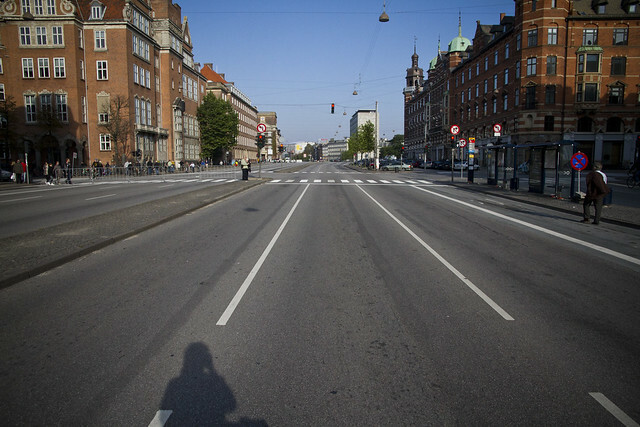 The ban on cars in the city centre of Copenhagen meant that 60,000 cars and trucks were kept out and 75 streets were car-free. Hans Christian Andersen Boulevard during the World Championships. 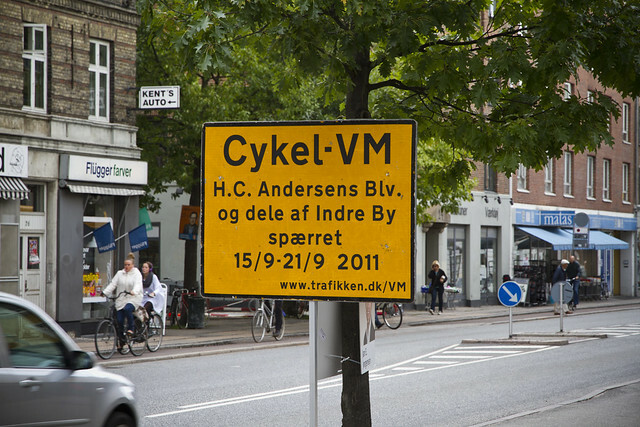 A few months before the event we had an idea at Copenhagenize Consulting. We were talking about the study done after 9/11 where temperatures were measured in the US for the five days that air traffic was grounded in the US. It was a unique opportunity to measure the effect that air travel has on the climate. An opportunity that wasn't likely to present itself again anytime soon. We realised that closing off Copenhagen's city centre to car traffic wasn't something that was likely to happen anytime soon - or indeed anything that any other city dared to do - and that it would be a brilliant opportunity to measure before, during and after pollution levels in the city. We promptly sent off the recommendation to the City's bicycle office and they were excited about the idea. As it turns out, they didn't have the chance to measure the air quality. The city has one permanent measuring station on Hans Christian Andersen Boulevard - the starting area for the bike races - but that wasn't going to be enough. Fortunately, the good people at the environmental NGO Miljøpunkt Indre By/Christianshavn had precisely the same idea and they had the chance to get out and measure. Which is fantastic. Their report came out last week and they could show that there was a reduction of 30% in the dangerous, ultra fine particles from car traffic. 30% is amazing. Legendary. Signage in Copenhagen stating that Hans Christian Boulevard and parts of the city centre are closed for the World Championships. I spoke to Hanne Christensen from Miljøpunkt and Jens Hvass - the brainchild of the idea - about their project. Hanne told me that she measured the particles at 14 different spots in the city before, during and after the World Championships. She rode around on a cargo bike and used the sexily named 'P-Track, model 8525 Ultrafine Particle Counter' to carry out the measurements. "We wanted to show that Copenhagen could be an idyllic city without all the cars and a far less concentration of the floating, ultra fine particles from emissions that end up in our bodies. We counted on showing how clean the inner city air is when people ride bicycles and the streets aren't filled with car motors." 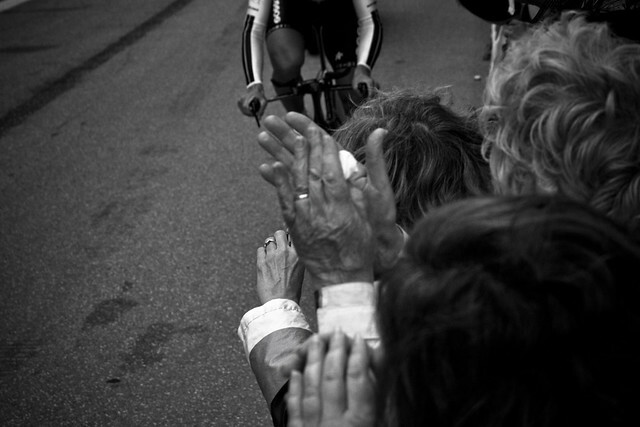 Bicycle traffic increased splendidly during the World Championships. Interestingly, measuring in the start area along Hans Christian Andersen Boulevard during the race days didn't show any reduction in particles. This was largely due to the many diesel generators running in the area and used for the race - mostly by the media. Hans Christian Andersen's Boulevard is a nightmare and a strange glitch on Copenhagen's journey to becoming a more liveable city. It is a wide boulevard with 50-60,000 cars a day (and about 20,000 cyclists) and it cleaves the city in two. There is little political will to do anything about it. Even the Dutch Fietsberaad was puzzled about how it was allowed to exist in their paper about Copenhagen - City Full of Cyclists. Hanne Christensen from Miljøpunkt measuring from her Nihola cargo bike. Measuring air quality along the route didn't produce any great results either. While the lycra-clad racers were C02-free, they were accompanied by a fleet of 100 Skodas speeding after them, an armada of motorbikes and helicopters and loads of diesel generators groaing away in the start area. Elsewhere, however, a sharp reduction was clearly measured, almost from one day to the next. 30% in all. There is a lot of talk about putting a congestion charge ring around Copenhagen, like in Stockholm, Oslo and London. It is estimated that this congestion charge ring will reduce the levels of ultra fine particles by 5-10%. We support wholeheartedly the idea of congestion charges but one of the problems is that it will really only reduce the level of private cars - which pollute 'less' that vans and trucks. Companies will just pay the charge and keep driving into the city while motorists will return to public transport. In many European cities there are Environmental Zones which weed out the worst offenders. We blogged about this back in 2008 (are you embarassed City Hall?) Our former Mayor in charge of traffic and environment, Klaus Bondam, had a great idea that was never realised - when pollution levels are too high, you stop the traffic entering the city. With all that said, we now have numbers showing how reducing car traffic in Copenhagen reduces emissions and improves air quality and public health. Bring on the congestion charges. Make them tougher than ever. Set an example. 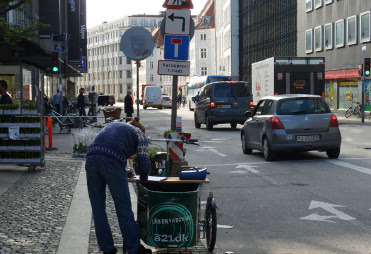 Copenhagen wants to have 50% modal share on bicycles by 2012... uh, no... 2015... uh, no... 2025. There is no way this will happen unless we stop ignoring the bull. Regarding Klaus Bondam and his amazing work for cycling in Copenhagen: I don't know if it's more frustrating to live in a city without any visionary politicians at all or to have had one for four years - of the kind that only appears once in a generation - and then to be left in a vacuum of nothingness afterwards. Oh, by the way... if you want to relax in the spot with the best air quality in Copenhagen, visit the Library Gardens between the Parliament and the Royal Library. It's an oasis for clean air. The report from Miljøpunkt Indre By/Christianshavn is available - in Danish only - as a .pdf here.